As the Colorado Avalanche continue to tinker with their roster in the preseason, their goaltending merits some scrutiny as the regular season approaches. With only two preseason games under their belt, the jury is still out on how the summer changes will impact the team. But make no mistake – there are at least three key questions to keep in mind with the Avalanche’s goaltending. 1. Will Varlamov be Healthy Enough to Be No. 1? Semyon Varlamov finished last season early, injured after a Chicago Blackhawks player crashed into him on March 30. 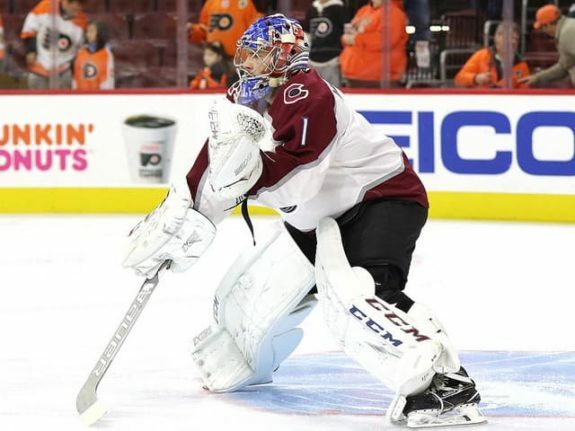 The Avalanche headed into the final regular season stretch relying on a banged-up Jonathan Bernier and a heroic effort by AHL call-up Andrew Hammond (aka ‘the Hamburglar’) to finish the season and man the net in their first-round playoff series. Varlamov was apparently dealing with a couple of different lower body issues after the collision and would be out for the remainder of the season. One injury alone is not overly concerning. However, in January, Varlamov missed nearly a month of hockey after suffering a groin issue. Again, not a big deal. Until one considers the previous year, when Varlamov left the season (also in January) for surgery to address his recurring groin and hip issues. He actually ended up getting TWO hip surgeries after being pulled out of the lineup multiple times with nagging groin problems. Last season, Varlamov played in 51 games with his average goals against running at 2.68 (GAA), earning a save percent of .920 and racking up 24 wins, 16 losses and six overtime losses. The wins placed him 20th among goaltenders, his save rate was ranked 25th and he finished 38th in GAA. It was a solid performance but not stellar. And the injuries are concerning. Compounding the unease was his 2016-17 season. Not only did Varlamov have the surgeries, prior to missing the season he backstopped 24 games, winning only six of them. He struggled with one of the worst season performances in his career. The surgery offered the hope that missing the second half of the season would help him come back better with his newly strengthened hips. Which leads back to missing last January with another groin injury. Perhaps it was just a fluke and Varlamov will rebound with a flourish. But it’s troublesome. His drive is not in question. Varlamov started informal practices with teammates a month ago. Known for his intense competitive spirit, Varlamov could very well set fresh career highs as he battles for his starting spot against the newly added Philipp Grubauer. It’s also the final year of his Avalanche contract. At only 30 years old, Varlamov should be looking for another lucrative deal on the horizon whether with Colorado or elsewhere. The real question boils down to whether or not Varlamov’s body will be physically able to keep up with his desire to excel. 2. Will Grubauer Challenge Varlamov as Starter? The Avalanche acquired former Washington Capitals goalie Philipp Grubauer over the summer to anchor their goaltending core. After having to go three deep in goaltenders to finish out last season, Colorado was serious about needing a quality net minding duo. Rumors circulated around the Avalanche wanting to re-sign Jonathan Bernier. However, Bernier’s desire to test the free-agent market forced Colorado’s hand and they ended up trading for the 26-year-old Grubauer, arguably the best goalie available this offseason. Grubauer boasts an impressive resume. 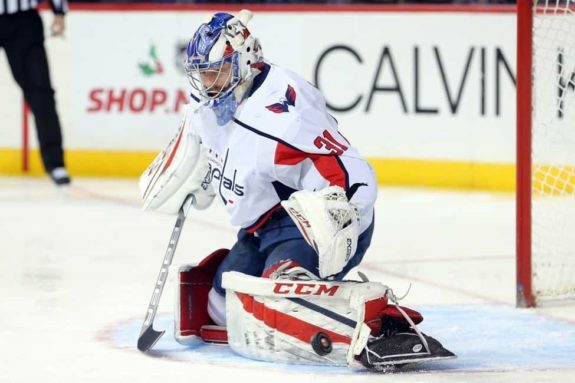 Playing the backup role in Washington, he racked up a 28-16-5 record over the past two years, including six shutouts. He also earned a .924 save percentage and a GAA of 2.19 over the same period. Last year he posted 15 wins in 28 starts. While Grubauer was crucial in helping the Capitals reach the playoffs, starting goaltender Braden Holtby carried the team through the postseason to win the Stanley Cup. In Grubauer’s two playoff appearances last year, he looked rocky, allowing eight goals and earning a dismal .837 save rate and averaging 4.57 GAA. However, Grubauer suffered an injury the end of March, which could have impacted his performance. The key questions all swirl around one premise: Can Grubauer challenge Varlamov for the starting goaltender spot? Can he handle the workload of a true No. 1 goaltender? Can he continue to build on past success or was his playoff performance a precursor of things to come? The competition between the two goaltenders as they head towards the regular season should be a win for the Avalanche. Watching the battle develop offers a win for the fans. 3. 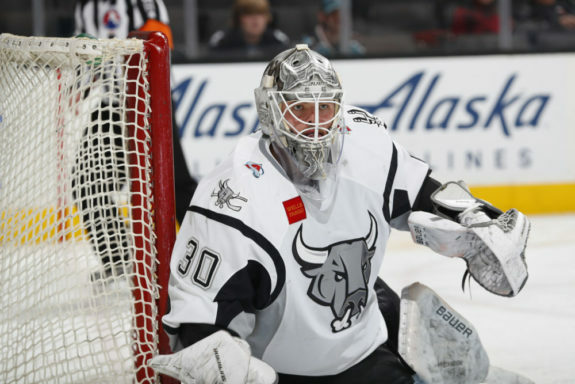 What’s In the Avalanche’s Goaltending Pipeline? After having to call up Spencer Martin from their AHL club last year to back-up third string goaltender Hammond in the playoffs, the Avalanche recognized the need for quality depth. Having to go four players deep to stock a backup goalie lit a fire to broaden the team’s talent pool. The Avalanche went off script to pick up Czech goaltender Pavel Francouz. The 28-year-old has spent the last three years playing in the KHL as well as for the Czech Republic in international competitions. Named the KHL’s goaltender of the year last season, he boasted an impressive .946 save rate and a miserly 1.80 GAA over the course of 35 regular season games. He appeared in 12 playoff matchups, where he earned a .949 save percentage and a 1.90 GAA. While his numbers are impressive, Francouz will need to adjust to the North American style of play. The ice is smaller and the goaltenders suit up for more games, carrying a heavier workload. The big question for him relates to how well he can adapt. Francouz presents a wild card option for the Avalanche. Should he be able to adjust to the different standards in the NHL, Francouz could put pressure on Varlamov and Grubauer. In training camp, he looked sharp in drills, positioned himself well and appeared to absorb all the coaching. Hopefully, he will play in one of the upcoming preseason contests, watching how he handles live NHL game situations. Francouz will likely start with the Colorado Eagles unless something untoward happens to either Varlamov or Grubauer. Assuming he adjusts to the NHL style of play, he will probably be the injury call-up. The loser in the Francouz acquisition could very well be Martin. The Avalanche selected Martin 63rd in the 2013 entry draft and he joined their AHL club in 2015-16. Martin has a lot to overcome. He did not show improvement last year, and actually appeared to get worse. At 23, he should be showing a continual improvement in his play yet he earned a disappointing 3.10 GAA and an uninspired .893 save rate. His numbers dropped marginally for three straight years, not the direction the franchise wanted from a goalie aiming for an NHL slot. The most challenging issue for Martin, though, may have occurred during the end of last season. During the compiling goaltender injuries, coach Jared Bednar seemed loathe to put Martin on the ice, even when Bernier looked shaky. That’s not a ringing endorsement. Martin could have a bounce back year, though, as not all of last season’s troubles were his fault. The Avalanche shared their AHL affiliate with St. Louis before moving their alliance to the Colorado Eagles over the summer. Sharing an AHL affiliate with a competitor within one’s own division created a number of issues, all of which resulted in a lackluster season where the AHL team finished last in their division. None of the other prospects in the Avalanche goaltending pipeline are ready to compete on the NHL level. Only Francouz and Martin appear ready for a backup role in Colorado, with the interesting story revolving around how well Francouz adjusts and whether he will be ready to pounce on an NHL slot if the door opens. Either way, the Avalanche should not rest on their laurels. While they have shored up their options in net, developing some depth in the upcoming pipeline should be on the forefront of their radar. Both Varlamov and Grubauer looked solid in training camp and practice. Yet both suffered in their single preseason matchups. Whether Francouz can capitalize on their weak performances remains to be seen. The next week should be exciting on the goalie front. As the Avalanche head towards the regular season, the goaltending competition could very well be the most interesting story to follow. The quality of the competition should propel the players to new heights, yet the variables could play havoc with the results. With one of the youngest teams in hockey, the goaltending will likely be key to the success or failure of the Avalanche’s season.